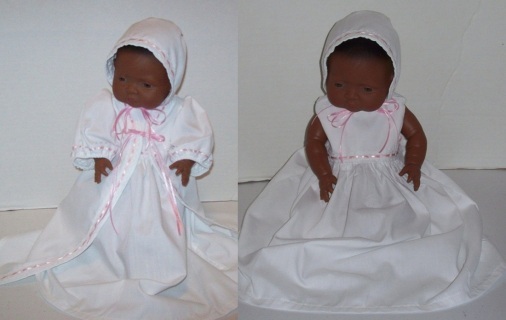 Alejandra's Babies for Baby Dolls 12-20"
White cotton Jacket, Dress and Bonnet are trimmed in white eyelet insertion lace and baby pink ribbon. Bonnet has double ties and yoked back. Dress has front and back yoke, snap close. Machine wash, dry and iron on gentle setting to prevent snagging on ribbons. 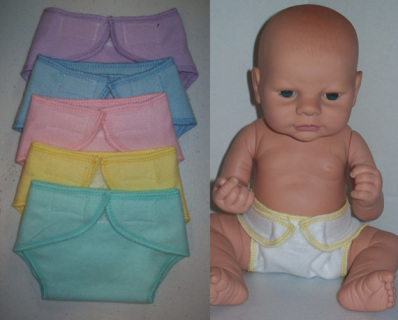 Made to fit 15-17" Hard Body Baby Dolls. Set of 5 Handcrafted Flannel Dolly Diapers. Each has adjustable Velcro closure tabs to fit dolly's from 13" up to 18". Each set consists of matching flannel and threads in an assortment. Not all colors shown will be in package. Cotton flannel is machine wash and dry with warm iron. DOLL IS NOT INCLUDED. Free Shipping is USA Only. Priority and Express Mail are extra cost. Please allow up to 4 days for assembly and shipping. White diaper is for show only and not available with this listing.